Popups seem all the rage right now. I could list all the ones running over just the summer, trying to take advantage of England's limited Summer, but I would run out of ink and interest by the time I got to the end of the list. Don't get me wrong, I love them. They give you an opportunity to experience something away from it's natural habitat. It's just that there are so many these days, it's hard to keep up. Dri Dri gelato is a great example of what I love in a popup. They sell ice cream, an immediate plus. With their regular home ensconced in West London, where I would happily travel to for a meal but less so for some gelato, I now get a chance to sample their wares a mere stones throw from the front door of my office. The interior is clean and pared down, with the ice cream residing in what seems to be a cart akin to a beach hut, with a little walkway guiding you to the ice cream. Here you will find a myriad of stunning flavours on offer. Alongside all the familiar gelato and sorbetto flavours, you can find more exotic flavours like liquirizia (licorice) and bacio (a "kiss" of dark chocolate and hazelnut), as well as specials such as salted caramel. I guess it was no surprise that I wanted salted caramel, but as it was late in the day, it looked like it was running low and could have done with a little more refrigeration. Instead I opted for a half and half combo of caffè Espresso and pistachio. The espresso was pleasant, but quite mild in flavour and overly milky. A more accurate description would probably have been a caffè latte. Better was the pistachio, which tasted of the roasted nuts I love, smooth, creamy and a hit of sweetness. It always surprises me how well ice cream parlours do in London, the weather is hardly conducive for their existence most of the time. With Gelupo and Scoop already within spitting distance, it would seem crazy on the face of it to introduce yet another gelateria to the area, but Dri Dri seems busy and continues to shift gallons of rather decent gelato. It makes sense to take up residence within the Summer months, and expect to see them move out once the weather starts getting a bit colder (in about 2 months). I'd have opted for the salted caramel too - can't get enough of it! Bacio is another firm favourite too - they sell it all over italy and that nutty chocolaty flavour is just divine. I love making my own ice cream but you can't beat the choice in real italian ice cream parlours like this - so glad it's doing well. @ Sara - It sort of is, just with a lower fat content. I'll take it whatever it may be. @ thelittleloaf - I am headed straight for that salted caramel next time. Like you, I find it fascinating that ice cream parlours are surviving in London at all given the weather. 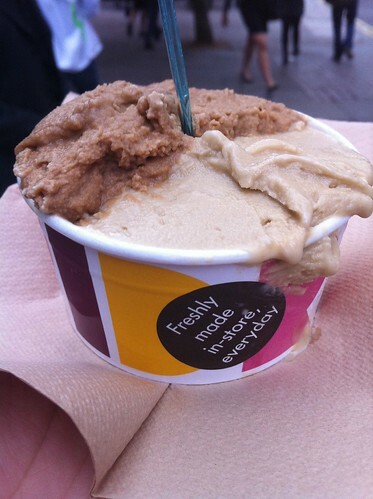 The funny thing is that I almost swear off ice cream after tasting Heston's Mustard savory ice cream from Waitrose. Seriously, you'll need a slab of beef to get that down your system! Bacio is one of my favourites in Italy, I must try and get to the pop up as I too wouldn't likely get to West London for ice cream. I adore proper pistachio ice cream too, it's not so easy to find one that tastes of pistachio rather than almonds! Their branding looks insanely cool. 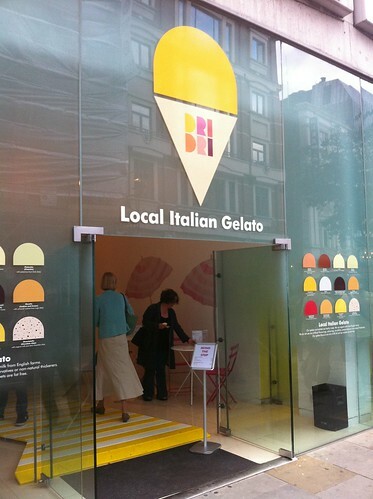 Love the logo and the pictures of the different flavours of gelato on the windows. My God, soon Covent Garden will be nothing but ice cream parlours. Saying that, I will obviously be straight down there for some salted caramel ice cream. That sounds like good stuff. i know. all this rage of pop-ups and artisan gelato in a city where summer is a short spell is quite peculiar. seem's like we had the same thoughts on the espresso gelato.